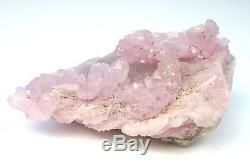 ROUGH ROSE QUARTZ CRYSTAL TAQUARAL BRAZIL NATURAL GEMSTONE 382 CARATS #556. CRYSTAL TAQUARAL BRAZIL SPECIMEN CRYSTALLIZED NATURAL GEMSTONE 382 CARATS #556. Dimension(length x width x depth): ca. 74 x 43 x 33 mm. Clarity: transparent, translucent crystal, clusters on crystal quartz mother stone. Speciality: super rare, only one find in the 70. We are always available to help you. We answer your questions as quick as possible. Please inform us for all amendments. We generally dispatch with DHL/Deutsche Post AG which is trackable. 50-500 grams worldwide 10 USD. Karl Hahn & Co e. Please ask the custom office in your country about those additional costs and terms. If you need a gem certificate, we will arrange this for you. The price of a gem certificate is an extra cost please ask us if it is desired. Gemstones are a natural product whose saturation and colour can appear. Differently depending on your computer hardware such as monitors. Internet browsers and the conditions of light under wich the stones are. Therefore we recommend to download(only for to see colors). The picture and see it. A closer idea of the real saturation. _gsrx_vers_783 GS 7.0.5 (783). 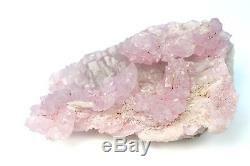 The item "ROUGH ROSE QUARTZ CRYSTAL TAQUARAL BRAZIL NATURAL GEMSTONE 382 CARATS #556" is in sale since Thursday, January 19, 2017. 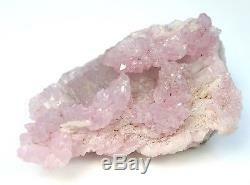 This item is in the category "Jewelry & Watches\Loose Diamonds & Gemstones\Loose Gemstones\Quartz\Rose Quartz". 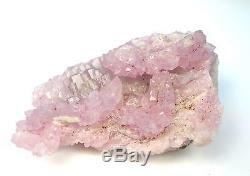 The seller is "rough_gems_and_minerals" and is located in Fischbach. This item can be shipped worldwide.